In a triumph of history over prosaic functionality, the campus recently unveiled the new name of a 120-bed residential complex for graduate students. What had been known as the College-Durant apartments, easily found at the intersection of College and Durant Avenues in Berkeley, a block south of the campus, will henceforth be called the Ida Louise Jackson Graduate House. The new name honors a pioneering African American alumna who graduated in 1922 and earned her master’s degree at Berkeley in 1924. The apartment building, which opened its doors to students upon its completion in 2002, originally housed both upper-division and graduate students. Starting in the fall, the entire complex will be devoted to graduate students. Its furnished apartments offer space for 120 students in units housing two to six students each, with a private bedroom for each inhabitant. Ida Louise Jackson enrolled at Berkeley in 1920, when there were only 17 African American students on campus. Among her many firsts and pioneering activities, she co-founded the Rho chapter of Alpha Kappa Alpha, the first African American sorority at Berkeley. She was the first African American woman certified to teach in California schools and, in 1926, became the first African American of either gender to teach in Oakland. As an alumna, and as national president of Alpha Kappa Alpha, Jackson led sorority trips to the Deep South to help educate blacks, particularly in her native Mississippi. She founded a summer school for rural teachers there in 1933, followed the next year by the Mississippi Health Project, which helped inoculate more than 4,000 infants and children against diphtheria and cholera. 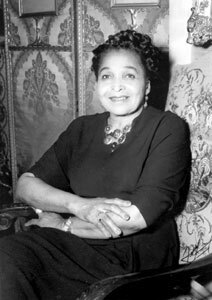 After a brief interval as dean of women at Tuskegee Institute, Jackson returned to Oakland. She taught at McClymonds High School until her retirement in 1953. When her brother died two years later, she took over responsibility for managing her family’s sheep ranch in Mendocino County. In 1972 she donated hundreds of acres of that property to the University of California, requesting that the proceeds be used to support graduate fellowships for black students working on their dissertations at Berkeley. She died in Oakland in 1996, at the age of 93. The renaming announcement was made by Mary Ann Mason, dean of the Graduate Division, at an April 14 reception honoring donors of graduate fellowships.